At a press conference held this morning at the Mirabaud HQ in Geneva, Dona Bertarelli and Yann Guichard unveiled their future plans for Spindrift Racing along with two new sponsors for the team. The Mirabaud bank comes on board as a Gold Partner with the watchmaker Zenith appointed Official Timekeeper. Both companies have committed their support for three years starting from 2014. From Louis Blériot to Felix Baumgartner, Zenith has left its mark on the history of aviation and space. Equipping many explorers, the watchmaker has contributed to major advances. It is in this spirit that it has joined Spindrift racing as Official Timekeeper. Jean-Frédéric Dufour, President & CEO, Zenith states that: “At Zenith, we like to focus on personalities and projects are going places. Dona, Yann and their teammates have the makings of these modern heroes who are creators of dreams. We are honored to join our watches to their future performances." 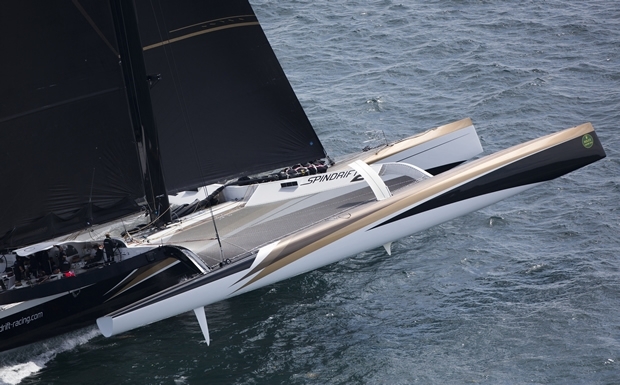 Spindrift Racing runs three campaigns simultaneously - Dona Bertarelli's Decision 35 Ladycat which competed for the catamaran class' annual Vulcain Trophy. Then there is the Brittany heart of the operation where the team has a MOD70 and Spindrift 2, the former Banque Populaire, at 40m long, the largest racing trimaran in the world. Even though the team has been campaign the maxi-tri for just a year, they have already notched up line honours in the Rolex Fastnet Race and last autumn set a new fully crewed record for the Route of Discovery course from Cadiz, Spain to San Salvadorin Bahamas, lowering the time by more than 20 hours after crossing in 6 days, 14 hours, with an average speed of 24.5 knots. "Spindrift racing is a young team that brings together a group of professionals whose work has quickly borne fruit," explains Dona Bertarelli, owner and skipper of Spindrift Racing. "Our project has grown and already has a good international reputation. With Yann, we have the cards in hand to take the next steps. "The support of partners has been part of the strategy of the team from the outset. We want to nurture our entrepreneurial approach by developing synergies with other companies who are also leaders in their field. Meeting the needs of companies who trust us enough to share these big adventures lifts us all up together and enriches the story that we are writing each day. Whether risk management in the banking sector or the high-tech business of precision watches, Mirabaud and Zenith understand what we are doing. I am very pleased to welcome to Spindrift racing these two Swiss leaders who are such symbols of success and long-term partners of major human achievements and challenges." As to the program for this year, once again Ladycat will be competed on Lake Geneva, making this her eight seasons. While Dona Bertarelli will held the 35ft one design lake catamaran, Guichard will be on board as her tactician. "This summer, Spindrift 2 will attempt to beat the impressive record time set across the North Atlantic in 2009 by Pascal Bidégorry and his crew on board the same boat,” says Guichard. “With a time of 3 days, 15 hours and an average speed of almost 33 knots, we will need an equally exceptional weather window and optimised boat to break it. We will also attempt the 24 hour record during this, if conditions allow." While the west to east Atlantic record from New York to the Lizard will be carried out with a full crew of 10-12, he this morning announced that he will racing this same giant boat singlehanded in the this autumn's Route du Rhum, from St Malo to Pointe a Pitre, Guadeloupe. "This is an opportunity to share a special moment with our partners while providing an exciting challenge for the team,” says Guichard. “As a competitor, I have a deep desire to pit myself against other Ultimate class trimarans. However, it was never a question of transforming Spindrift 2 into a 'solo' boat, but rather to find the best compromise in order to be efficient for the dual purpose of the North Atlantic crewed record and the Rhum. The decision was developed in accordance with Dona and our partners. The transatlantic trip from Miami last winter, when I skippered under reduced sail and operated alone, was what finally convinced me. The shortened mast, general weight-reductions, autopilot adaptions and a number of other details will allow us to realise this and other challenges. While this XXL boat will be the largest in Saint-Malo, we will be facing machines made or optimised for singlehanding. However, I'm a competitor and we are working to ensure we can play at the front. And for someone, like me, with a passion for multihulls racing alone on such a boat will be absolutely unforgettable!"